Here, on the official website. 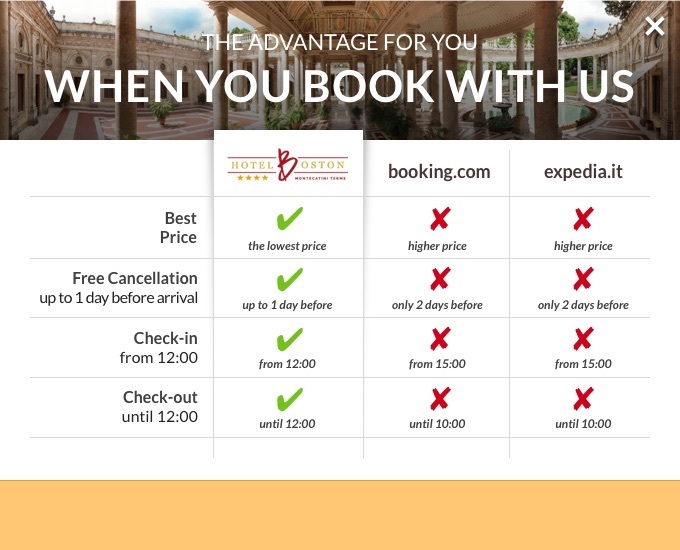 Booking your holiday on this website allows you to save 5% immediately compared with Booking.com and Expedia. Do I have some benefits if I book directly? Free Wi-Fi in the rooms and the common areas. Late Check-out up to 12 noon and luggage storage. The room is available from 2.00 pm on the date of your arrival. The reception at the Hotel Boston is open all hours, every day. The outer doors are closed at midnight, but the night porter is available. Your room is available up to 11.00 am. Is there a Wi-Fi service in the Hotel? By booking from this website you will have free Wi-Fi throughout the Hotel. Yes, a sweet and savoury American Buffet is available from 7.00 am to 10.00 am. On request, packaged and certified gluten-free products are available. Does the Hotel Boston have a restaurant? The Hotel Boston has an internal restaurant open to 9.30 pm, which offers typical Tuscan cuisine and national cooking. Do I have a discount for the Montecatini Terme? -10% on the entrance fee to the large open-air Thermal Swimming-pool and on all wellness treatments. What are the swimming-pool’s opening hours? The swimming-pool is on the panoramic terrace of the Hotel da Vinci which belongs to the Biondi family and is located 30 metres from the Hotel Boston. Entrance is free from 8.00 am to 9.00 pm. Yes, all the rooms have independent air-conditioning. Pursuant to the Italian legislation for public areas and premises, all common areas and the rooms in the Hotel Boston are NON Smoking. In order to respect all guests who will stay here after you, please comply with this rule. No, for reasons of hygiene, pets (including small ones) cannot stay in the hotel. Children up to the age of 3 stay free of charge if they sleep in their parents’ bed. On request, cots (camp beds) are available at a cost of € 15.00 per night. For older children, you should look at the Triple Room charge. Yes, we accept: Visa, MasterCard, Maestro, CartaSì and American Express. Is the visitors’ tax already included? No, this municipality tax which consists of € 1.40 per person, per night, up to a maximum of 7 consecutive nights, must be paid on arrival at the hotel. Children under 10 do not pay visitors’ tax. Is the Hotel in a restricted access area? No, it lies just outside. This is why you can reach the front entrance of the hotel directly by car. Is there car parking available in the Hotel? The Hotel Boston has a private car park which is available by reservation with an extra charge of € 7.00 per night. There are car parking pay-spaces in front of the Hotel and a large free public car park 700 metres away. How far away are Florence and Pisa airports? We are 30 minutes away from the Amerigo Vespucci Airport in Florence and 40 minutes away from the Galileo Galilei Airport in Pisa. The main train station (Montecatini Terme – Monsummano) is only 700 metres away. Is it possible to organise a transfer to and from the airport? Certainly, please contact reception for the additional costs. Where is the Cable Car? The cable car train which takes you to Montecatini Alta, the old part of the town, is only 800 metres from the Hotel. A special experience for immersing yourselves in the green area and to plunge into the past. How can I reach the historic centre of Florence? There are many trains at varying times which connect Montecatini Terme to Florence Santa Maria Novella every day. The journey lasts 50 minutes. What can I visit in the hinterland? There are historical towns and important art cities such as: Pisa, Lucca, Siena, San Gimignano, Pistoia and Viareggio On request, at the Hotel Boston you can also join organised tours to the hinterland, led by expert guides. How far is the PalaTerme? The Hotel Boston is close both to the PalaTerme and to the town Swimming-pool; the two buildings can be reached with a 10-minute stroll.